Poster No poster available at this time. Not available in poster format....yet but we may publish this if there is demand. 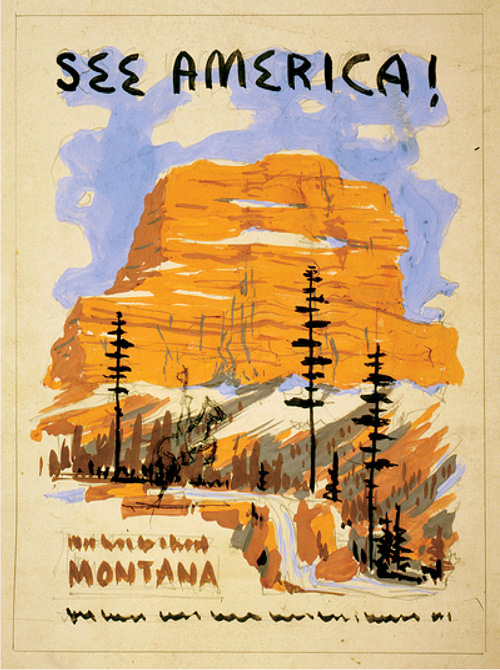 This is a very unique design and was never completed by WPA artists but did survive to the present in the Library of Congress collection. It depicts Chief Mountain in Glacier National Park. The original half-finished sketch showed a pencilled-in suggestion of a "Wyoming buckaroo" rearing horse, now trademarked by the State of Wyoming. We changed this to a packtrain complete with double diamond hitches. 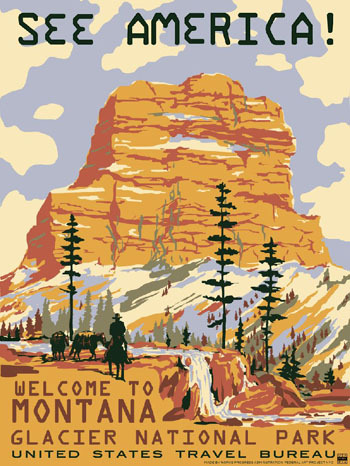 This was designed by the New York WPA Federal Poster Project for the U. S. Travel Bureau, which was later absorbed by the Department of Interior.